Before I begin today's Life with Lynnie (LwL) entry, I would like to say that if my dad were still alive, today would be his birthday. I miss him. I love him. And, always will. Lately, here on LwL, I've been discussing love. Love of others for each other. And, of course, the love that God has for us. Today, I'll be addressing another issue of love. Love for me. As I've said in the past, there hasn't been much love for me. Not as a child, a young person, or even as an adult. However, there was love for me during part of my life. It's not here anymore. But, was for a time. 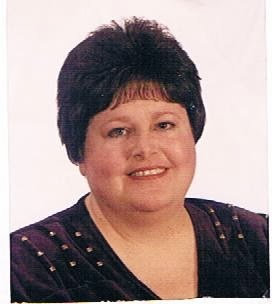 Gordon, my now deceased husband, loved me. There's something I need to let you know about. It has to do with something I never knew existed, until recently. You may think this is strange, but it is true. For several years now, I have used a digital camera. Prior to this, my now deceased husband, Gordon and I used cameras that used film. A while back, I found some films that had not been developed. I realized that they may not even be able to be developed, since they were several years old. However, a few weeks ago, I took them to a location where, in the past, I used to get my film developed. One film was even stuck in a camera. But, they were able to get it out. And, processed all the film. When I picked up the photos, and looked at them, it was just a few days before Christmas. I happened to be at a Tim Horton's location in South Windsor, waiting for someone to join me. At first, I was rather unhappy that she hadn't arrived, but when I saw what I found in the photos, I began to cry. And, couldn't stop. Ultimately, it made me happy she hadn't been able to join me, or even contact me to let me know. After waiting about an hour, and fighting with myself to not continue crying, I got up and went home. For a couple of days, all I could do was cry. Just like I'm doing as I write this. You may not understand why this shocked me. Especially, since I knew Gordon loved me. His friends at work used to sometimes call him Gordie. Or, El Gordo. El Gordo means... the big one. His workmates sometimes called him this, because he was tall. And, had gained some weight, even though he wasn't much overweight. This photo was actually taken in Pennsylvania, USA. During a trip into USA, we had stopped for a day to visit Christian friends, who lived there. The husband was a retired pastor. He and another friend of his, had invited Gordon to go with them to see something that had been built in their area. The wife and I stayed and had tea, together. During this time, we had discussed a video film I had given her, showing her the part of Northern Ireland that I had recorded on a visit there, in the area where some of my relatives live. The area was the same area, where an online friend of hers lived. Plus, it was also the area where some of her ancestors were from. The men left us and drove to see what it was they were going to see. On the way, they came to a covered bridge. They stopped and looked at it. It was then, that Gordon must have written what is shown in the 2004 photo. A photo I had never been told about. Nor, seen. I believe I have dealt well with grief. Yet, I found this photo heart-breaking to see. It reminded me of the love that I no longer receive. Even though I have accepted Gordon's death, it makes me cry just thinking about his love for me. And, how I miss him, and his love. Even so, my love for him will never die. I believe so. After all, I feel the same with regards to my parents, my brother, some other relatives and friends, who died. My love for them, will never die. Much like my love for Gordon. And, Gordon's love of God. 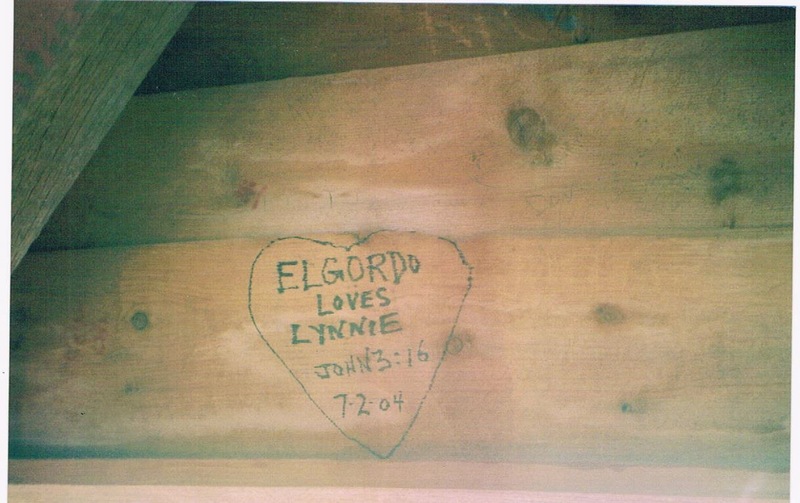 Just as the photo shows, where Gordon wrote the scripture verse of John 3:16, "For God so loved the world, that he gave his only begotten Son, that whosoever believeth in him should not perish, but have everlasting life." God loved us so very much, that He created a plan of redemption for us. Salvation through us trusting in/believing upon His Son, our Lord, Jesus Christ, who came to earth in obedience to God the Father. Jesus could have left the earth at any time. But, He didn't. Instead, He stayed and led people to understand what He would have us do. Jesus died for us. He could have left the cross where He was hung on, but He didn't. Instead, He suffered and died on that wooden cross, and was resurrected. By doing this, He paid the price for the sin of the world, of all who would believe upon Him. He now sits at the right hand of God, the Father, in Heaven. Jesus sent the Holy Spirit to help us. Encourage us. And, lead us, the way God would have us do. As you can tell, love is so important. At least to us, humans. The love of God, to be sure. Love for other people, too. I just know that if God brings someone else into my life to love, there will be love, again. For if this happens, it will be His will.